Slash Shipping Costs and Keep Customers Smiling, too! Managing an e-commerce business is like walking a tightrope. You have to poise two heavy weights on either side to strike a balance—endlessly increasing operating costs on one hand and ever dynamic customer expectations on the other. Customers primarily expect e-commerce brands to sell and deliver inexpensive (but high-quality) products in the shortest time span possible. While free shipping makes online shopping very attractive to customers, the demand for it can put a huge strain on an e-commerce business’ profits. During the past few years, free shipping has come to be expected as a default choice in online shopping. A 2017 Baymard Institute study found that 60% of customers abandon shopping carts due to high extra costs like shipping, tax and handling fees. The inherent problem, however, is that no e-commerce business can survive without recovering shipping costs. 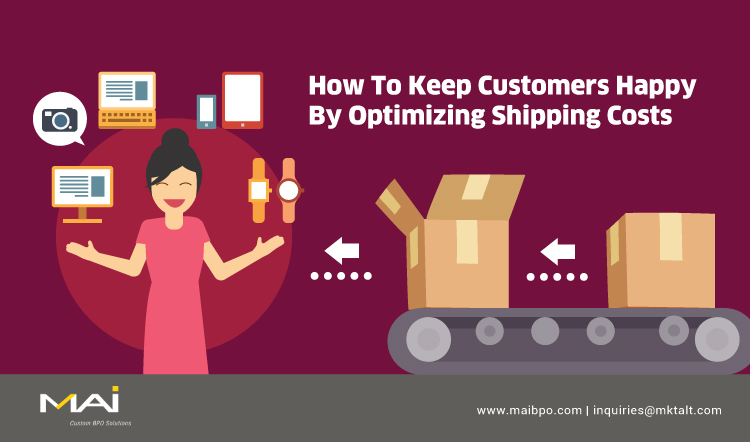 So how can e-commerce businesses optimize their shipping costs and still keep customers happy? Here are a few ways to strike the ideal balance. In logistics, even an ounce or a few hundred grams more than the agreed weight can put your shipping slab into a higher rate slab. Especially in cargo shipping where the cost is usually estimated based on the volume or space occupied, packing it right is important for the transporters. Right packing can save dollars which would otherwise be spent on additional container space. Maximum space utilization combined with fewer transports result in direct shipping cost savings. This can be done by having several packing options or box sizes that would fit a cargo container or a carrier truck in the best manner possible. You can play around the boxes in a Tetris-like pattern with a number of small, medium and large boxes to fit the maximum number of boxes in a single consignment. When it comes to packing, the choice of material might not seem to be a significant factor, but you must consider the goods being shipped. For example, fragile or breakable items can end up damaged and other merchandise – like electronics or books – can be ruined by wet conditions during transit if the wrong choice of packing material is made. The costs for packing materials can also vary substantially, so the choice of a standard cardboard box versus a poly mailer is key when it comes to saving or incurring shipping costs. Another way to keep your shipping costs to a bare minimum is to compare shipping rates from multiple carriers before zeroing in on a final choice. Most popular choices like UPS, FedEx and USPS offer their own shipping cost calculators. They also offer various types of packing options which perfectly suit the need of e-commerce players. Outsourcing a critical commerce function like logistics often results in cost savings. Third-party logistics players adopt new-age technologies and innovative shipping methods to deliver value to their clients. Their physical presence across geographies and experience help even just-launched e-commerce enterprises scale their operations quickly. The 2018 3PL Study also reports that “71% of those who use logistics services (shippers) said the use of 3PL services has contributed to overall logistics cost reductions”. The benefits do not end with cost reductions, but outsourcing a sophisticated business process logistics gives enough room for the management and the resources to spend time on activities that demand their immediate attention. Sometimes you can have your cake and eat it too. You can optimize your shipping costs for maximum profitability as well as ensure customer satisfaction. In this age of mobile-window-shopping, customers are spoiled with choices. At the swipe of a finger, they can find an alternate supplier who can get them what they need with shipping included at no extra charge. So recovering the shipping cost from the customer may not always be the right choice. Striking the right balance between saving operational costs and catering to customer demands can help you manage your e-commerce business flawlessly, from start to finish, from order until delivery.